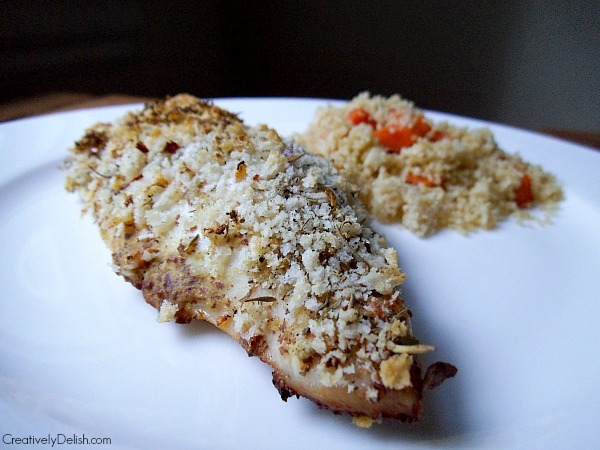 Perfectly seasoned, crispy baked chicken with bold flavor, served with a savory Roasted Carrot Couscous. If you grew up in the 90's and early 00's, you've probably had Shake'n'Bake, right? I can remember those commercials like it was yesterday, with that funny little kid saying, "It's Shake'n'Bake, an I helped!" We would typically have it on pork chops but occasionally chicken was thrown in to the mix - no pun intended - and it always came out so darn good. I really have no clue what is actually in that boxed mix, but I'm sure it's full of crap I wouldn't dream of purchasing now. 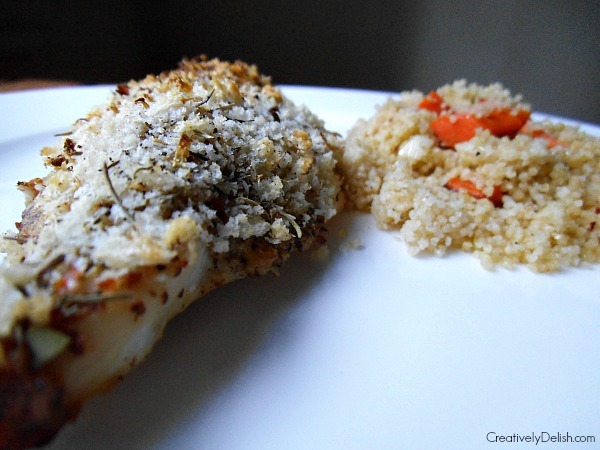 Thankfully this Herb Crusted Chicken tastes just like the classic, only healthier and not full of the fat and sodium that the original has. The flavor was enhanced with a coating of country dijon mustard over the chicken with the home-made breading patted lightly over each chicken before being slow roasted for a crisp outside and a juicy inside. 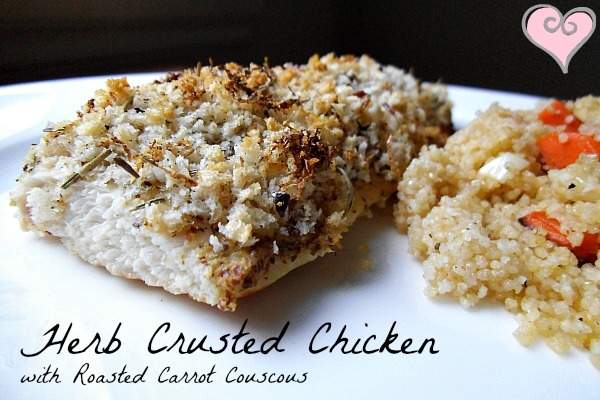 The chicken is baked to crispy perfection, and perfect for a quick weeknight meal. 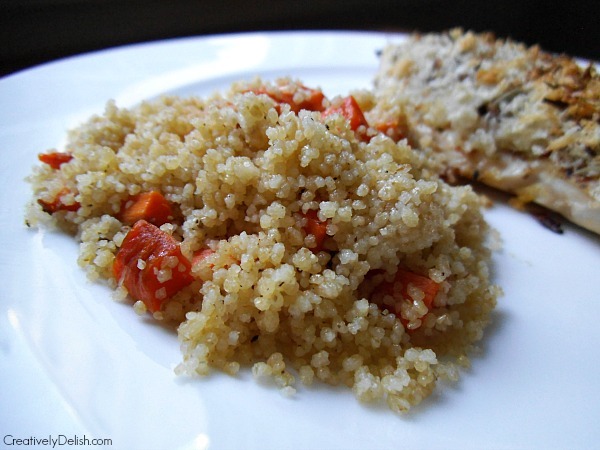 If you've never heard of couscous, it's a tiny little ball of pasta that can be served as a "rice" style side. Just be careful with portion sizes! One serving, 220 calories is about 1/3 cup. Which is why I added the roasted carrots to give it some more bulk. 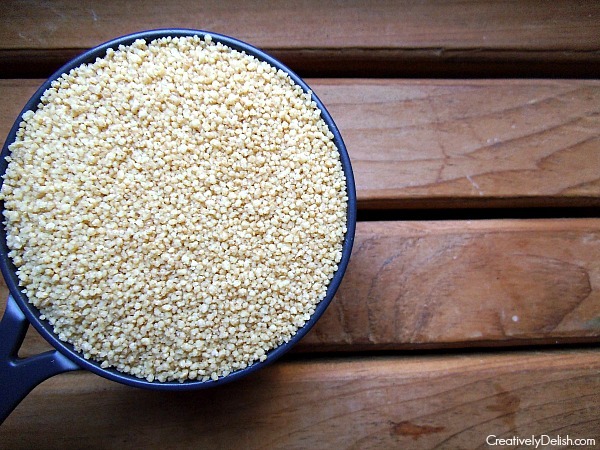 Find a couscous that comes plain and cook according to the package directions, using the salt and olive oil they recommend. 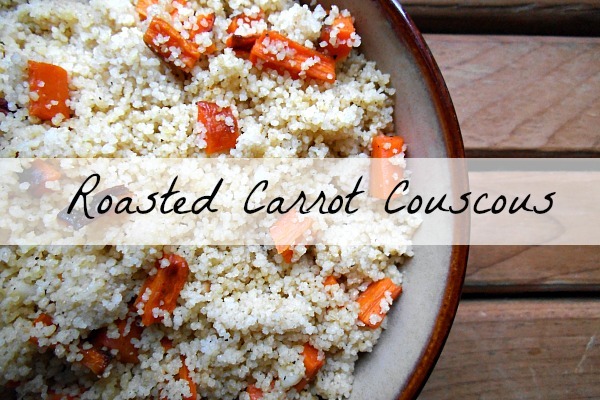 On a baking sheet, toss peeled and quartered carrots in some olive oil (about 1 tablespoon for 4 large carrots), and bake at 450 for 20 minutes. In the last 5 minutes, add some chopped garlic to the pan to roast the garlic. Remove it from the oven and chop the carrots and mince the garlic. Add everything in to the pot of couscous, sprinkle with s&p and you're done! 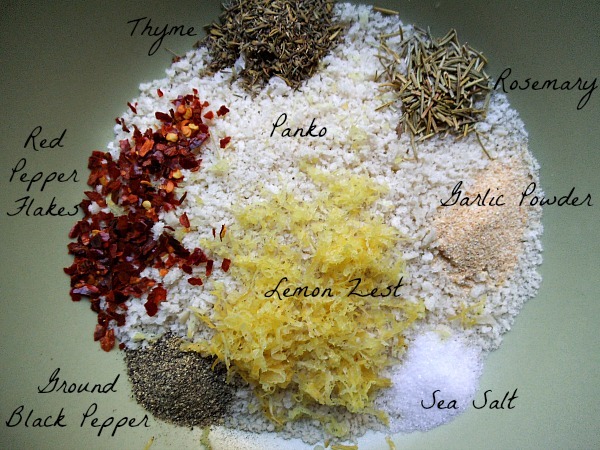 In a large bowl, combine thyme, rosemary, garlic powder, salt, pepper, panko, lemon zest and red pepper flakes. Prepare a baking sheet with tin foil. Make a thin layer of mustard over each side of the chicken, then put them on the baking sheet. Sprinkle the panko mix over the tops of each chicken, patting it down slightly to get the mustard to hold the mix. Bake for 25 minutes or until chicken is done, then enjoy!